Services we offer In addition to restoration, we offer the following services : Welding, mechanical repairs, bodywork and chassis repairs, servicing, and engine rebuilds. We are renowned for our expertise in welding and are pleased to work on a wide range of welding jobs, from repair work to complete chassis restoration. We can meet outside normal working hours We are open 9.00 to 5.30 Monday to Friday, but can make arrangements to meet clients outside these hours if necessary. However, if you are making a special trip to visit us, please ring first in case we are out inspecting vehicles at our clients' properties. 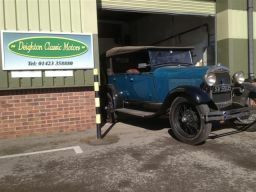 About us We provide servicing, repairs and full MOT preparation for all makes of classic cars. We also carry out restoration and recommissioning. Conveniently located at Tockwith in North Yorkshire, Deighton Classic Motors provides a full range of classic car services to all makes of classic cars, from vintage to modern classics, British made or from further afield. Many of our customers have entrusted the care of their vehicles to us over a long period of time and most of our new customers come to us through word-of-mouth recommendation. Classic car restoration can be a complicated and costly process. We welcome your involvement at every stage and encourage you to call in any time to view progress on your vehicle. We also provide a photographic record of the work undertaken. We have established excellent working relationships with experts in areas such as upholstery, spray painting etc and will ensure that work carried out by third parties is of the highest standard.